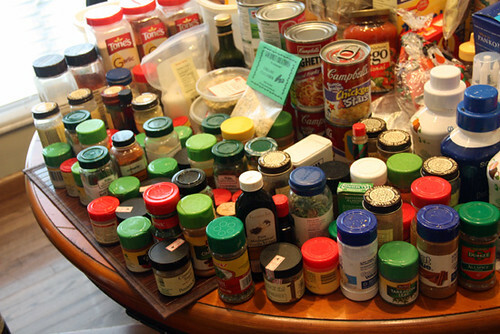 Since marrying Brian last October, we have had a lot of ‘junk’ to combine… one of them being our hundreds of spices! 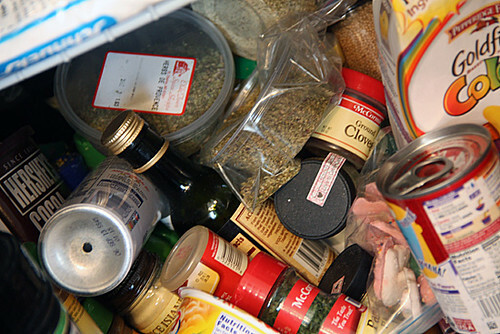 We both love to cook, but when I tried to combine his spices with mine in my small pantry… it went down hill rather quickly. 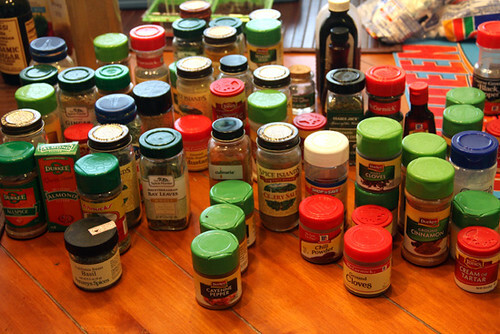 Here is a photo of the spice shelf (yes, the spices were taking up an ENTIRE shelf of my pantry!) before I got my hands on it. Its crazy. 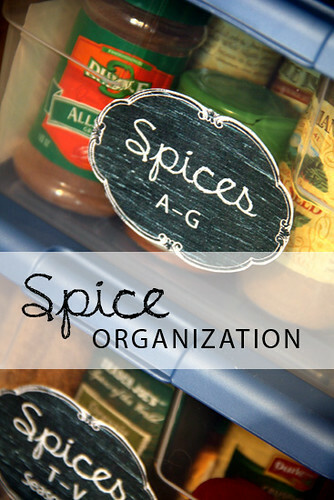 There are spices, things that aren’t spices… and, believe it or not… behind all of that MESS is a three tier organizer shelf with even more spices on it! 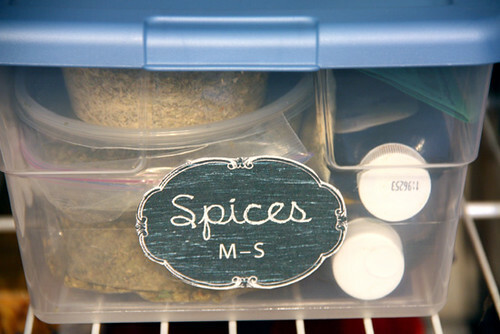 I got that tier organizer at the Container store years ago and it just could not handle the amount of spices we had after saying I do! 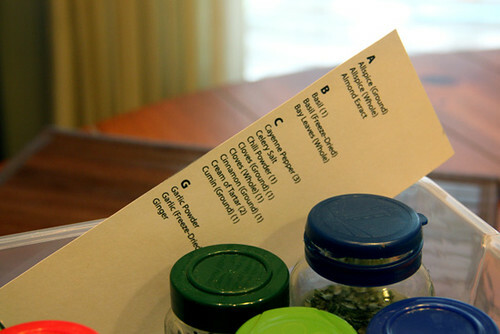 Next, I organized the spices by alphabetical order… If I had more than one spice (ie: 3 jars of basil), I would put them one behind the other. 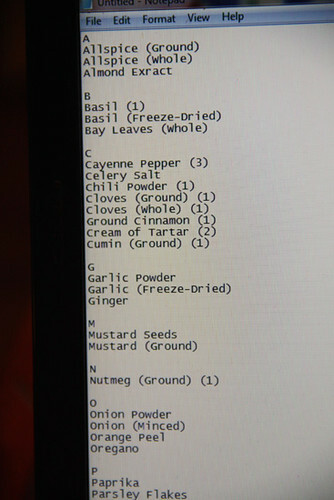 Then I opened up Notepad on my laptop and I wrote down all of the Spices in a list. I would put ground, whole, etc. after their name and in parens I would put the quantity I have of that particular spice. I put the extra spices in a plastic bag to store elsewhere and I tossed the ones that were almost empty or that I knew we’d never use again. Then, I put the rest in storage tubs in alphabetical order. 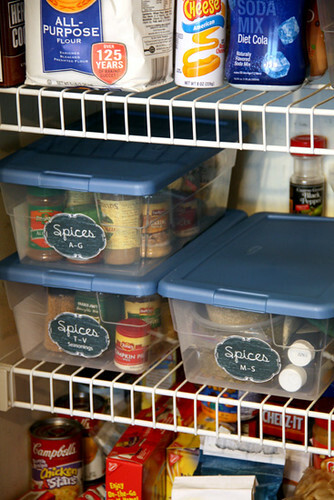 I had measured my pantry’s height and width before purchasing these storage tubs so I would know how many I could fit on one shelf. Next up was some face time with my laptop! 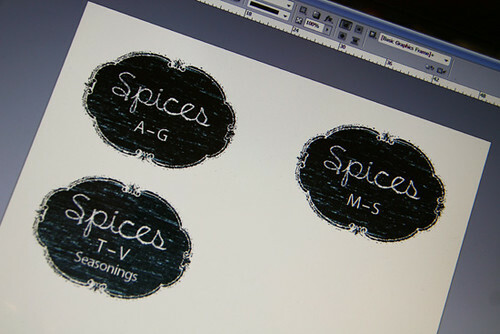 I looked for some chalkboard label templates on Pinterest and I used some chalkboard fonts to use on my labels. 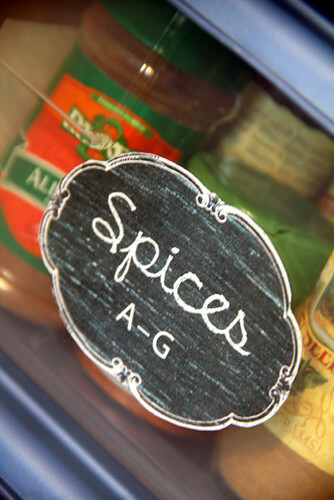 I decided to put Spices on the top of the label and the starting letter and ending letter of the spices that were in that storage tub. 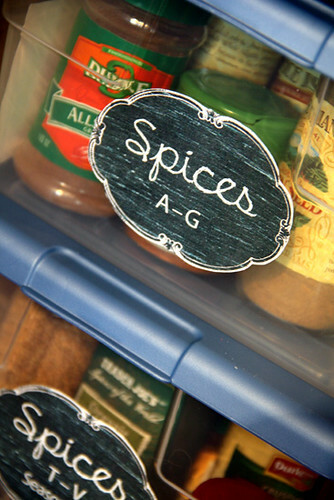 For the last storage container I also had a separate line just for Seasonings. Then, I started on the content cards. 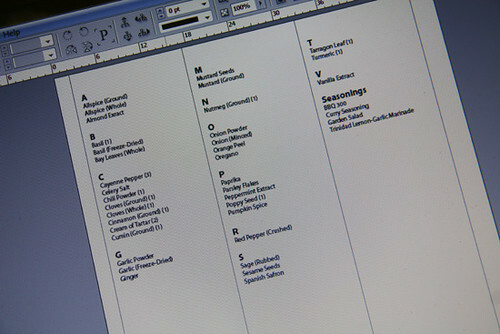 I made a 3 column document in InDesign and dumped my Notepad text into it which contained all of the spices we currently own. 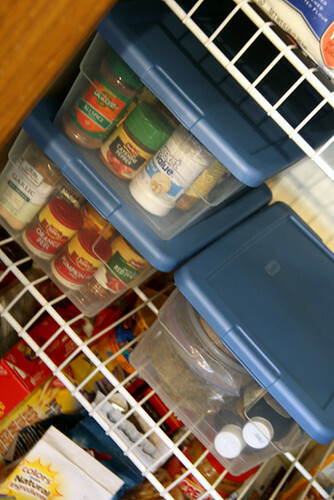 I had three storage containers so each column was for what was in each storage container. After designing them on the computer, I sent them to my printer and cut them out with scissors. Easy as pie! I put each of my content cards in each container it belonged in. 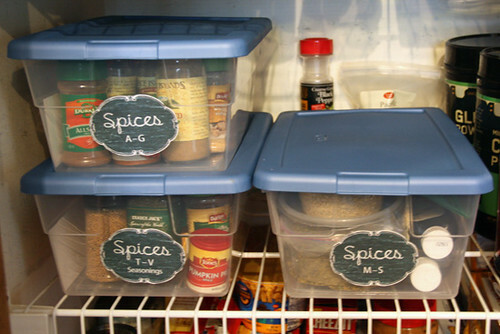 After that, I taped the labels on to the front of the storage container they belonged to. And, ta-da! 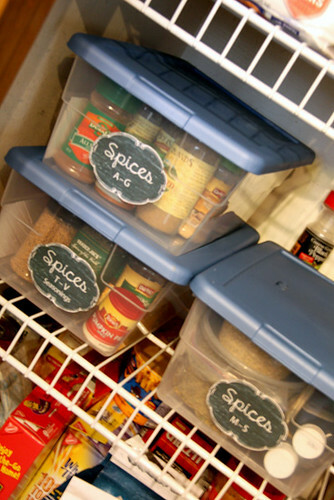 My spices are organized! The can’t get knocked over, shoved around, taken out and put in my 4 year old’s grocery card… they are stuck in this container until Brian or I take them out! And, that is how I like it! 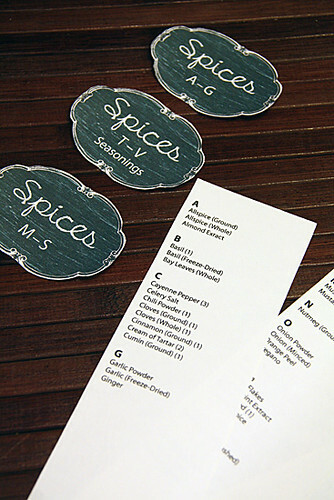 I just love how well these labels worked out, too… I love the chalkboard look, yet it was printed on my inkjet so it can’t smudge like real chalk. 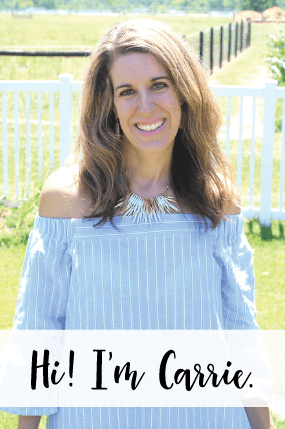 It always makes me feel so good to organize something in my house that has been out of control for quite some time. Now I will sleep peacefully tonight. 😉 lol.